The stage is awash in a synthetic scrim that flows as it illuminates or reveals the wondrous silhouette of a ballerina before the eerie strings flood the ear with waves of sound and the chime discreetly cues the next change. Lost souls—bandaged, amputees, labourers—wander aimlessly, climb ladders to nowhere and scream their desperation into the reverberation-rich mics. Over a bed of low-strings, a collage of the tortured universe descends from the fly tower; guitar and punchy brass muscle in to the forever-evolving soundscape as the snakes-and-ladders game settles below. Soon there’s a traffic jam of wheeled objects being pushed into the mad village square. A frenzied kaleidoscope of sounds and colour confirms the highly structured lunacy. Too high for one who kicks away his support and sputters briefly at the end of his rope before morphing from anguished soul to horrific set dressing. A running attendant—with a cowbell necklace—wheelbarrows the recently departed and shifts the corpse to a sled, adorns him with a single candle even as onlookers say adieu to dead cabbage. After the family frame is staged and shot, the brass tries to compete with a solitary squeeze box. The voices awaken. A searing soprano—occasionally sour on descending lines—is backed by Volga male chorus and adorned by en pointe angel. A hint of Adam and Eve with the famed apple—keyboard as the backdrop—completes the artful potpourri of disciplines. A solo cello is at one with the screened lone wolf. A trapeze ladder holds the army buddies’ interest. The Waltz Macabre—with its soaring sax—convincingly intertwines with the Villa Lobos-like wails. More limbs are lost, the pain of which is dissipated by a vintage snowball fight captured by sheer curtain, even as its red-velvet counterpart opens for the play within the players. Marvellous is the rabbit’s zesty aria, which leads—of course—to a whistling and horn duel with white canes “en garde.” The beautifully shameless waistcoat stretched taut on the oh-so-male dancer is showered with melodic lines. The scrim plunges into the liquid deep—what else than accordion would suit? 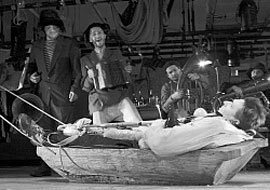 The sailors take stage—armed or not—and delight all with their Russian Follies, working the now fallen angel with copious amounts of too-long-at-sea passion; only the “boy” can’t obtain his celestial reward. A rousing frame of produce-hockey soon inspires a skaters’ frenzy, tearing sideways down the magical plywood. With the celeste ringing in everyone’s ears, the dope-on-a-rope swings far and wide into the stands, but has no need of a net. Beauty turns orange; leather coats, bare feet, socks back on; the brown coats drag off the squeeze-box musician and beat him soundly. With red-hanky semaphore silently speaking, the victim finds himself in a crucifixion tableau, yet politely lights his persecutor’s fag. Freud makes a brief appearance with the snow-covered train-track shot, which—in turn—is aurally trumped by the violin’s stellar obligato.